Strengthen the education sector’s struggle and solidarity against imperialist plunder, crisis and war! The worsening protracted world capitalist crisis underscores the need for educators and education workers to strenghten the education sectors’ struggle and solidarity against imperialist plunder, crisis and war to fight for alternative education in building a new and better world for all oppressed and exploited peoples of the world. The US-led ruling elites in imperialist nations and their allied elites in neocolonies have intensified neoliberalism in key social institutions such as education resulting in continuing assault on the rights and welfare of education workers and promoting neoliberal ideology to counter militant resistance of the people for social transformation and national liberation. Neoliberalism has further accelerated the total state abadonment of education through cutbacks in government subsidies including Public-Private Partnerships and the record contractualization of education workers in developed and underdeveloped countries. Attacks on teachers and staff unions and their right to collective bargaining are also intensifying, demonizing the mass movement especially advancing efforts in countries that promote pro-people education. In the Philippines, contractualization and hiring of volunteer teachers has become a policy solution to the shrinking state subsidy to education. State universities and colleges that have their budgets slashed are forced to increase tuition and other student fees; hire contractual teachers and support staff and rely on private corporate investments. The same scenario is also happening in many countries in the global South even as it is also rampant in highly developed countries like Canada, among others. In response, education workers are fighting back. Across many countries, contractual teachers are demanding permanent status. In Indonesia, contractual teachers earning only $25 a month or less are protesting and asserting their security of tenure. Majority of their union members are on temporary contracts and some are nearing retirement. Last July, thousands of half-naked teachers from the state of Bihar gathered in Delhi, India to attract official attention in protest against non- payment of salaries in the last 15 years. Protesters claim more than 200,000 of them are on the brink of starvation. Education reforms are also implemented attacking teachers and education workers’ security of tenure. In June 2015, teachers in Chile have launched an indefinite strike opposing a new education reform bill that would require certification exams for teachers. They were also demanding better salaries and improved working conditions. Academic unions in Ecuador also opposed similar punitive measures against teachers who are required to undergo an evaluation process or be subjected to dismissal. In Albany, New York State United Teachers (NYSUT) marched to the State Capitol in protest of Governor Andrew Cuomo’s education reform that would overhaul the state’s teacher evaluation system, tenure laws and promote charter schools. Teachers, students and parents in the Philippines are asking the Supreme Court to stop the implementation of K to 12. Said education reform is expected to end in massive education workers’ displacement, worsened working conditions and promotion of export of cheap Filipino laborers to serve the demand of the globalized market. We salute the Alliance of Concerned Teachers in the Philippines for successfully forging a collective negotiation agreement with the Department of Education representing more than 100,000 teachers enabling them to assert their right to form unions, to strike and fight for better wages and working conditions. We affirm the significant role of the education sector in employing the largest number of public sector employees and in the promotion social and human tranformation of societies and nations. We acknowledge contradictions of capitalism bred resistance from the exploited classes of society. Teachers and other education personnel globally have stood arm- in-arm with the students, workers, farmers, other professionals and individuals in asserting that education is a right and in defending the rights and welfare of education workers and the people. While mainstream education is used to promote, defend and expand dominant/ imperialist interest, progressive organizations and unions of education personnel, together with militant student organizations have continued to assert, inside and outside the classrooms and in theory and in practice the liberating role of education that is in the service of the marginalized and the oppressed. We affirm the need for teachers’ unions and other education worker’s organizations to forge solidarity with anti-imperialist youth, peasants, workers, women’s organizations and other marginalized sectors to strengthen their own anti-imperialist and democratic objectives. We are inspired by the collective action of teachers and education workers in different parts of the world in addressing issues of exclusion, austerity, corruption and oppression emanating from their concrete experience of misery and unjust policies. We condemn the attacks on academic freedom and the rights of education workers across the globe. We call on teachers and education workers to unite with the anti-imperialist forces to address the root cause of the neoliberal education crisis. We link up with the broader national and global alliance against imperialism in making education serve the world’s peoples. We condemn the continued violation of the rights of workers in the public and private education sector. We demand the unconditional release of educators and education workers who have become political prisoners of neoliberal fascistic regimes. We denounce the unprecedented contractualization of education workers and the systematic demonization of the education sector’s mass movement struggling for a nationalist, scientific and mass-oriented education in many neo-colonies. We deplore the heightened militarization of schools and universities that take on various forms from actual occupation by soldiers of school campuses, to soldiers enrolling as students to do intelligence work and to military conducted seminars in schools and red-tagging teachers’, students’ and other progressive organizations. We are inspired by the success stories of militant protests, solidarity to expose and oppose and struggle for reforms defining pro-people education for social and human transformation and the development of genuine humanism. We recognize the experience of Cuban and Venezuelan peoples in transforming their educational system—demanding free education for all students in all levels through their governments investing in significant financing to public education, promoting sustainable campuses, community education programs in both urban and rural areas. In Venezuela, “university villages” were organized in immersing higher education to where the people are and in concrete realities of improving underserved communities. In Cuba, structures of decision making in mass organizations, communities and councils have been put in place. School and classrooms are designed to support and facilitate empowerment of student, family and community. We are encouraged by efforts of indigenous communities in Mindanao and elsewhere to claim their right to education through building their own schools that foster their education curriculum that serve their communities. We support the initiatives of Mindanao Interfaith Services Foundation Inc., and the Rural Missionaries of the Philippines, among others who have assisted in addressing the Lumad peoples’ right to education and their struggle for self-determination through such projects as the Salugpungan Ta’ Tanu Igkanogon Community Learning Center, the Alternative Learning Center for Agricultural and Livelihood Development, Inc. (ALCADEV), and other community-based indigenous peoples’ schools. Wherefore, we enjoin the ILPS to condemn these forms of human rights violations directed against educators and education workers and work towards their immediate and unconditional release. 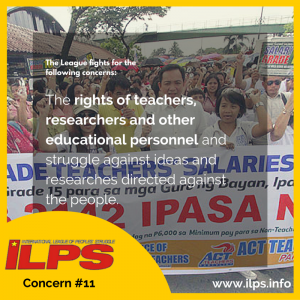 Wherefore, we enjoin the ILPS to condemn the various forms of militarization in communities and schools and work to stop the further militarization of said communities and education institutions. Wherefore, be it resolved as it is hereby resolved that the ILPS support the efforts of Commission 11 at developing and promoting a relevant, pro-people, mass oriented and scientific education curriculum for the liberation and upliftment of the masses in different societies.